We are located 14.5 northwest from downtown Ketchikan. We recommend using one of the cab services or renting a car. Car rental agencies will even pick-up or drop-off cars at the marina. Info can be found on Condos page or local links page. Plan for RAIN! The Tongass National Forest is a temperate rain forest. Our coldest month is January (median temperature 33 degrees) and our warmest month is July (median temperature 58 degrees). Average annual rainfall for Ketchikan is around 13 feet! It does not rain as much at Knudson Cove as it does downtown Ketchikan but we still average around 9 feet a year. Marine forecast for our area can be checked here (NOAA Weather). We recommend dressing in layers and having light-weight, breathable rain gear. Charter boats provided rain gear if needed. Our store sells bait, tackle, sunglasses, sunscreen, raingear, bug spray, sodas, bottled water, candy, chips, beer, ice... etc. Charters provide all gear needed. If you rent a fishing kayak, rod/reel and light tackle is included. We rent salmon rods and halibut rods for $10.00 per day. Salmon tackle box comes with leaders, swivels, hoochies, measuring tape, bait cutting guide, fillet knife, flashers and dodgers. State of Alaska Department of Fish and Game regulations can be found on-line or at the marina store. You can even download a pdf form of the Southeast Alaska regulations booklet. Any emergency orders are posted at the marina. Gateway Smokehouse provides processing with daily pickups at the marina. All cruise ship charters have this option. Guests wanting to do their own processing: We have a cleaning table, commercial vacuum packer, walk-in freezer and we sell wet-lock fish boxes. Frozen fish in a wet-lock box stays frozen for several hours (freezer is set at -10). A majority of our guests take fish back as luggage and have no issues with fish thawing out before they arrive home. You can also arrange for FED-EX to pick up fish and have it sent overnight. Is it okay to feed the ducks? YES! We have several mallards that live in the marina and we encourage people to feed them. The ducks are our pets and quite often you will see them wading behind a charter boat... waiting for any left over crackers or cookies. Bald Eagles, Harbor Seals, Black Bears, Orcas, Humpback Whales, Sea Lions, Sea Gulls, Kingfishers, Ravens, Sitka Black Tail Deer... you never know what you might see! What else is there to do besides fishing? Take a hike! Great trails a Settler's Cove and Lunch Creek. See totem poles at Totem Bight State Park or Saxman Native village. Visit downtown Ketchikan: Southeast Alaska Discovery Center, Historic Creek Street, Tongass Historical Museum, restaurants and shopping. 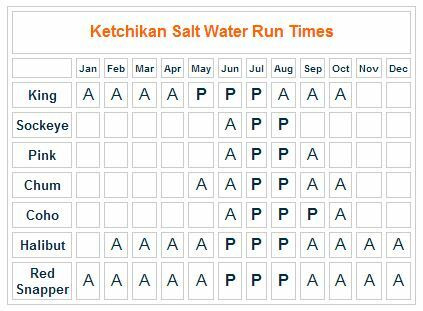 Ask our staff while here about activities and/or check out the Ketchikan Visitors Bureau site. What is the number to Dockside Galley?